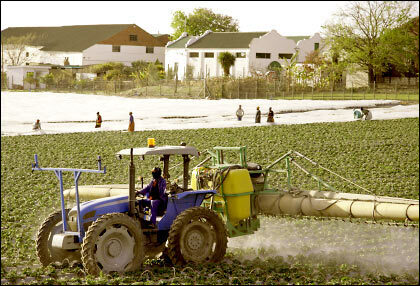 A tractor sprays pesticides on a food crop. A new UC Berkeley study finds a link between prenatal exposure to pesticides and attention problems at age 5. “Given that these compounds are designed to attack the nervous system of organisms, there is reason to be cautious, especially in situations where exposure may coincide with critical periods of fetal and child development,” said study lead author Amy Marks, who was an analyst at UC Berkeley’s School of Public Health at the time of the study. Other co-authors of the paper on attention problems are Kim Harley, Asa Bradman, Katherine Kogut and Caroline Johnson at UC Berkeley’s Center for Children’s Environmental Health Research; Dana Boyd Barr at Emory University’s Rollins School of Public Health; and Norma Calderon at the Clinica de Salud del Valle de Salinas. The authors of the PON1 paper include Nina Holland and Karen Huen at UC Berkeley’s Center for Children’s Environmental Health Research.